Are you ready to go on an adventure in the deepest Pantanal? This trip will lead you through amazing places, giving you the possibility to enjoy breathtaking sights. Travel from São Paulo to Cuiabá. After spending the first night there, in the morning, you'll go to Porto Jofre, which is known for being the best place for spotting the jaguar. During this journey, you'll have your first chances of sighting a huge variety of birds as well. After spending two nights there and a full-day expedition on the river, you'll spend the following three nights in a Pousada in Poconé, where you will have the opportunity to ride real Pantaneiros horses, go on hikes in the nearby areas, and also enjoy excursions by boat, as well as night expeditions. Transfer from Poconé to Cuiaba. Have breakfast at your hotel in Rio. Then, transfer to the airport to catch your flight bound for Cuiaba. Once you arrive, check into your hotel there. Situated in the heart of the Brazilian cattle country, Cuiaba serves as the capital of Brazil’s Mato Grosso State. While many visitors make use of the city as merely a jumping-off point for the wetlands of the Northern Pantanal and the magnificent Chapada dos Guimarães National Park, those who linger will find an array of interesting sites and activities to keep them blissfully engaged. The city boasts three impressive shopping centers, some tempting cafes, and restaurants, a vibrant party scene, as well as an attractive downtown area complete with excellent live music and colorful street stalls. The world’s biggest inland wetland system, the Pantanal Reserve is a biodiversity hotspot and one of Brazil’s premier tourism destinations. Encompassing rivers, lakes, marshes, floodplains and both perennial and non-perennial streams, it is home to myriad exotic wildlife species, including jaguars, hyacinth macaws, giant anteaters, capybara, and caimans. 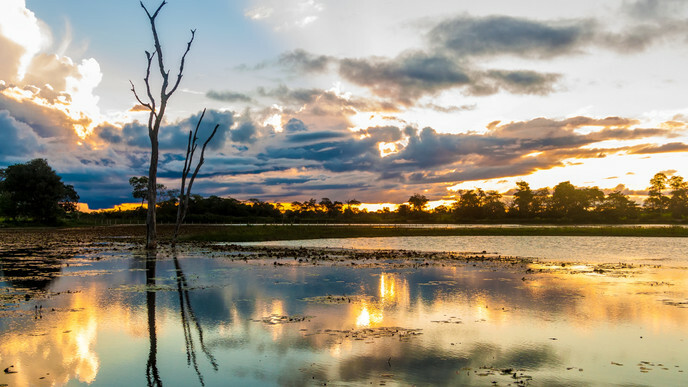 Birdwatchers and animal lovers will be in their element here – the Pantanal is considered in some circles to be a superior game-viewing territory compared to the Amazon, where the dense foliage obscures much of the wildlife. Have breakfast at your hotel and transfer to Porto Jofre, passing through the famous Traspantaneira, where you will have the chance to observe a huge variety of animals that inhabit the area. Once you arrive enjoy your lunch. The rest of the afternoon is free to spend as you wish. Start your day off with breakfast at the hotel and, early in the morning, depart on the boat tour in search of the famous "onça pintada". At the end of the tour, return to the hotel for dinner. Mato Grosso is the country’s third-largest state, situated on a vast plateau in the Brazilian Highlands and encompassing three distinct ecosystems – lush Amazonian rainforests, the rich wetlands of the Pantanal Reserve, and the savannah lands of Cerrado. Have breakfast and leave for your hotel in Pocone. Upon your arrival, check in and enjoy your lunch. After lunch, at the end of the afternoon, go for a walk to watch some animals. Dinner will be served at the hotel. After dinner, go for a walk in search of nocturnal animals. Early in the morning, go for a walk through the trees, before breakfast, to see the stunning sunrise in the Pantanal. This is a show of nature that you can't miss. After breakfast, go horseback riding. Return to your hotel in time for lunch and in the afternoon, take a boat tour along the Novo River or Claro River. With a little luck, you will have the chance to see a family of ariranhas or an anta and a lot of birds. At night, if you are interested, you can go on a nocturnal tour. After breakfast, go horseback riding through the "panteiros" fields. This is going to be an easy ride too. During the ride, you will have a chance to spot animals and birds. After lunch, you will have some free time for enjoying the swimming pool. In the afternoon, go on a tour along the Transpantaneira Highway, where you are expected to see capybaras, crocodiles, coatis and a lot of other bird species. If you are lucky, the guide will also show you a tamanduá or perhaps a Pantanal deer. You will later be transferred to Cuiaba to take your flight back to Rio.